The public is divided over President Obama’s recent executive action that expands the number of undocumented immigrants permitted to stay and work in the U.S. At the same time, Americans continue to broadly support a pathway to legal status for people in this country illegally. About as many disapprove (50%) as approve (46%) of Obama’s action, which could make up to 4 million people newly eligible for deportation relief. Roughly eight-in-ten Republicans (82%) disapprove of the executive action and about seven-in-ten Democrats (71%) approve of it, with very strong attitudes on both sides. The new national survey by the Pew Research Center and USA TODAY, conducted Dec. 3-7 among 1,507 adults, finds that 70% say there should be a way for undocumented immigrants to stay in the country legally, if they meet certain requirements. Most of those who support legal status think there should be a way for unauthorized immigrants to become citizens (43% overall), while 24% say the path should only include permanent residency. These opinions are little changed from October. A majority of the public continues to give poor marks to Obama on how he is handling the nation’s immigration policy (56% disapprove vs. 38% approve). But his immigration approval rating is six points higher than it was in November 2013 — and is up 24 points among Hispanics since then (67% approval, up from 43%). Obama’s executive action on immigration draws more intense opposition (39% disapprove very strongly) than intense support (30% approve very strongly). Among Republicans, 71% disapprove very strongly. And 83% of Republican and Republican leaners who agree with the Tea Party disapprove very strongly. By comparison, about half of Democrats (52%) very strongly approve of Obama’s action. Hispanics overwhelmingly support the deportation-relief action: 81% approve, including 59% who very strongly approve. But non-Hispanic whites disapprove of it by nearly two-to-one (62% vs. 34%), with nearly half (49%) disapproving very strongly. Overall, adults 50 and older disapprove of the executive action by narrow majorities, while younger adults are more supportive of it. Overall, views are little changed about a pathway to legal status for unauthorized immigrants who meet certain requirements. The share in support of a legal pathway ebbed slightly after a surge of Central American minors crossed the border during the summer (dropping from 73% to 68%), but now is at 70%. 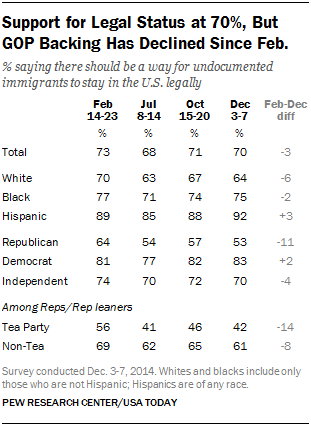 However, support among Republicans has dropped since February, when nearly twice as many (64%) said there should be a way for undocumented immigrants to stay as said they should not be allowed to stay (34%). 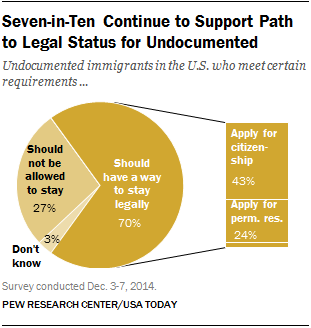 Today, 53% of Republicans support a pathway to legal status and 42% think there should not be one. There is a large divide in opinion among Republicans and leaners based on agreement with the Tea Party. Tea Party support for a legal pathway dropped dramatically between February and July (from 56% to 41%) and sits at 42% today. But a majority of non-Tea Party Republicans and leaners (61%) say there should be a way for unauthorized immigrants to stay legally. Support for a legal pathway among Hispanics (92%) and Democrats (83%) remains as high as at any point during 2014. Ratings of how Obama is handling the nation’s immigration policy have slightly improved since late August but remain mostly negative (56% disapprove vs. 38% approve). Opinions about the president’s handling of immigration were more negative than positive throughout his first term, though he started his second term about even (44% approve, 43% disapprove) before dropping to 32% approval last November and 31% approval this August. Hispanics’ approval of Obama’s immigration policy has never been higher after plummeting earlier in the year; last November, just 43% approved and 51% disapproved of how he was handling immigration. In the aftermath of Obama’s deportation-relief policy, two-thirds of Latinos (67%) now approve and just 27% disapprove. On balance, non-Hispanic blacks remain positive toward Obama on this issue: About six-in-ten (61%) approve of his handling of immigration and 32% disapprove. Non-Hispanic whites have moved little over the past year, with 28% today approving of Obama on immigration policy and two-thirds (67%) disapproving. In general, about two-thirds of the public say they are “very sympathetic” (23%) or “somewhat sympathetic” (42%) toward immigrants who are in the U.S. illegally. Another 15% are somewhat unsympathetic and 17% are very unsympathetic. That sentiment is similar to feelings in June 2013, although the share saying “very sympathetic” has risen 7 points. By a wide margin, Democrats are more likely to say they are sympathetic (78%) than unsympathetic (21%), as are independents (64% vs. 33%). Republicans are narrowly divided – 52% are sympathetic toward unauthorized immigrants and 45% say they are unsympathetic. Compared with last year, more Democrats and independents say they are “very sympathetic” toward unauthorized immigrants (up 11 points and eight points, respectively), while Republicans’ sympathies are unchanged. 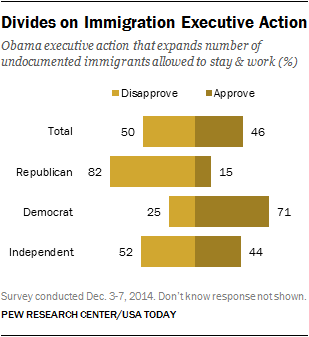 Differences in sympathies correlate with approval of Obama’s executive action. Among those who sympathize with immigrants in the U.S. illegally, 62% approve and 35% disapprove of his action. By contrast, just 14% of those who do not sympathize with unauthorized immigrants approve of the action, compared with about eight-in-ten (82%) who disapprove.